Google’s algorithms are a complex system used to retrieve data from its search engine and instantly deliver the best possible results for a query. The search engine uses a combination of algorithms and numerous ranking signals to deliver webpages ranked by relevance on its search engine results pages (SERPs). Panda update lunched in the year of 2011 on February 24. Panda is also known as the “Farmer” Update was originally released in February 2011 intended punish sites with low quality content or poor user experience. If you were affected by Panda, there is probably something wrong with your on-site SEO, not your backlinks. The Penguin update is an update to the Google ranking algorithm, first carried out in 2012. Back then, the rollout of the update had massive effects on many websites. Google intended the update to fight webspam. Today, the Penguin update is a part of the core algorithm of the Google search engine. Updates to the Penguin algorithm now take place continuously and are no longer manual. What was the goal of the Penguin update? The Penguin update is mainly directed against webspam with the goal optimizing search results for users. This improvement was achieved with higher quality content improved technical website performance.
. Monitor link profile growth. Google isn’t likely to penalize a site for one or two spammy links, but a sudden influx of toxic backlinks could be a problem. 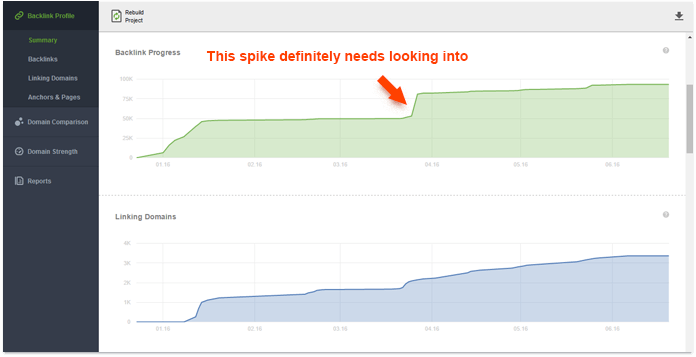 Look out for any unusual spikes in your link profile, and always look into the new links you acquire. By creating a project for your site in SEO PowerSuite’s SEO SpyGlass, you’ll instantly see progress graphs for both the number of links in your profile, and the number of referring domains. An unusual spike in either of those graphs is reason enough to look into the links that your site suddenly gained. 2. Check for penalty risks. The stats that Penguin likely looks at are incorporated into SEO SpyGlass and its Penalty Risk formula, so instead of looking at each individual factor separately, you can weigh them as a whole, pretty much like Google does. In your SEO SpyGlass project, switch to the Linking Domains dashboard and navigate to the Link Penalty Risks tab. Select all domains on the list, and click Update Link Penalty Risk. Give SEO SpyGlass a minute to evaluate all kinds of quality stats for each one of the domains. When the check is complete, examine the Penalty Risk column, and make sure to manually look into every domain with a Penalty Risk value over 50%. If you use SEO SpyGlass’ free version, you’ll get to analyze up to 1,000 links; if you’re looking to audit more links, you’ll need a Professional or Enterprise license. 3. Get rid of harmful links. Ideally, you should try to request removal of the spammy links in your profile by contacting the webmasters of the linking sites. But if you have a lot of harmful links to get rid of, or if you don’t hear back from the webmasters, it’s a good idea to disavow the links using Google’s Disavow tool. This way, you’ll be telling Google to ignore those links when evaluating your link profile. Disavow files can be tricky in terms of syntax and encoding, but SEO SpyGlass can automatically generate them for you in the right format. In your SEO SpyGlass project, select the links you’re about to disavow, right-click the selection, and hit Disavow backlinks. Select the disavow mode for your links (as a rule of thumb, you’d want to disavow entire domains rather than individual URLs). Once you’ve done that for all harmful links in your project, go to Preferences > Blacklist/Disavow backlinks, review your list, and hit Export to save the file to your hard drive. 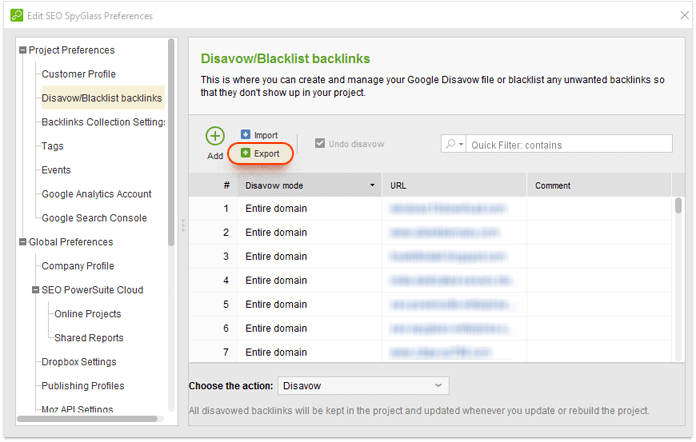 Finally, upload the disavow file you just created to Google’s Disavow tool.